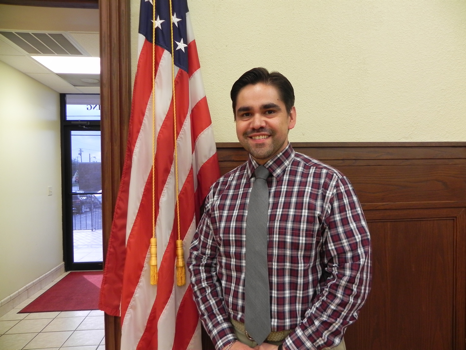 Luis Contreras has assumed the leadership role at the new San Benito Cultural Heritage Museum. Currently under construction, the facility will house exhibits representing the Texas Conjunto Music Hall of Fame, Freddy Fender and San Benito History, all museums that were independently founded, and which led to the creation of the new $1.7 million museum that measures almost 7,000 square feet. Completion is expected this fall. Contreras’s first full day on the job as museum coordinator for the City of San Benito was May 15. A part of the City’ Economic Development Department, his plan is to focus on promotion while overseeing and guiding the operations of the San Benito Cultural Heritage Museum (SBCHM). He sees the new museum as a destination. “Museums are more than just institutions and venues for research and entertainment. They are components that contribute to the local economy,” he said. He added that he will be working closely with the City’s downtown coordinator, Bernard Rodriguez, to develop a greater interest in business relocation and attractions to the City. After spending almost a decade in museums working mostly as the head of operations for the Weslaco Museum of Local History and Cultural Art in Weslaco, and the Mission Historical Museum in Mission, Contreras brings seasoned skills in strategic planning, public programming, community outreach, and economic development through heritage tourism, according to City Manager Manuel De La Rosa. He is a strong advocate for professionalism, innovation, diversity, transparency, efficiency, and excellence, the city manager said. Contreras contributed to various initiatives with the City of Mission. They involved historical research on various historical districts and sites, which included a historical assessment update of the rehabilitated historical landmark – La Lomita Chapel, project management for the museum grounds renovation project, downtown city streetscape project, and provided artistic designs for various city beautification projects. Since 2006, Contreras has also remained active in the education system as an arts instructor for the University of Texas-Pan American (now known as UT-RGV) and South Texas College. Additionally, he assumes a significant leadership role in museums as an executive member for the Texas Association of Museums council. Contreras holds a Bachelor of Fine Arts degree from the University of Texas-Pan American and a Master of Fine Arts degree from The Ohio State University. promoting, archiving,	preserving	and	permanently	displaying	the history of conjunto music.